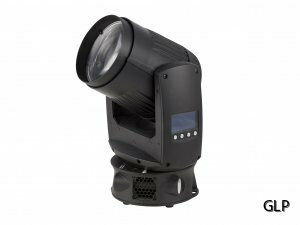 The new GLP impression FR1 is the latest compact LED moving head which offers a soft pencil beam and super fast movement and continuous pan rotation for amazing 3D multi beam designs. But that´s not all –the optical system can move from a 4°soft narrow beam to a 35°soft wide wash light. Optionally it is possible to remove the soft front diffusor to get a more hard edge beam in 3,7°. The high quality OsramRGBW Quad LED emits saturated colors and white light of all relevant color temperatures –selectable via RGBW-or CTO-Control. The new micro Fresnel front lens has a homogeny round image and visibility at plan view –which is needed for TV applications. The GLP impression FR1 has been designed with the famous baseless design and an extremely and compact body easily fitting into the tightest spaces of set designs from concert and touring stages, television and film, corporate events, set lighting to special events.